What is eMTeeBlack Box 1DMT? Currently it is an interactive 1D MT modelling package. 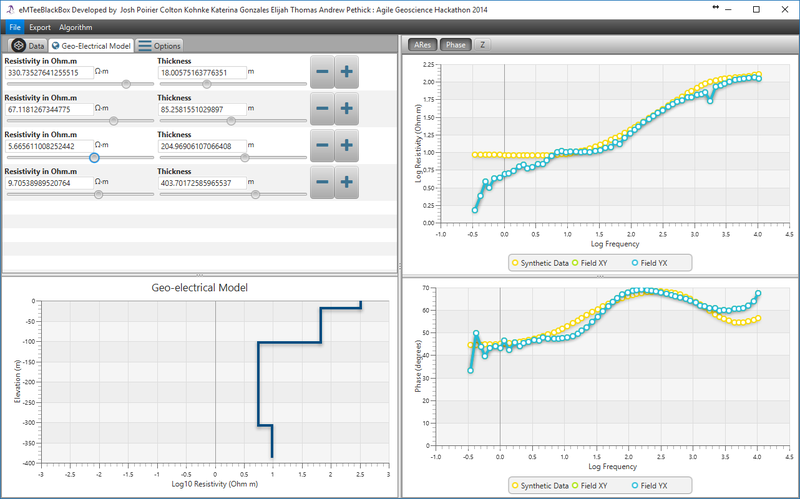 Load in field data, interactively model a response and export your geo-electrical model, synthetic data or modeled curves as an image. This software was born from the 2014 Geophysics Hackathon in Denver, Colorado. Shortly after the event it was fixed and expanded on and used for teaching purposes. This is now revamped and is more robust than ever! A screengrab of the eMTeeBlackBox 1DMT software package. For now it is pretty easy to use. Just play around with the sliders. You will quickly get the gist of how to use the program.